ENENSYS, has announced that its ATSCheduler – ATSC3.0 Broadcast Gateway – was successfully used in the recent live Next Gen TV showcase by WRAL-TV (Raleigh, NC), NBC Universal and NAB. The technology has also been deployed is also deployed in several other US trials and by broadcasters in Korea. 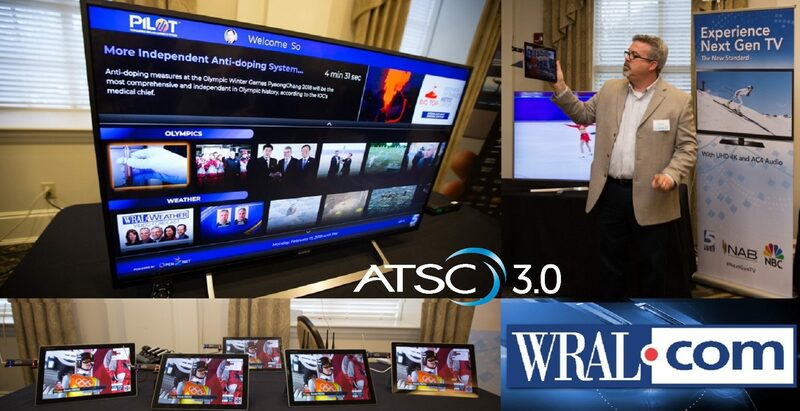 The showcase was designed to not only highlight the technical capabilities of the technologies involved but also to clearly show the greatly enhanced audio and video quality that ATSC 3.0 facilitates alongside additional interactive applications. The live broadcast delivered 4K video as well as the first over-the-air use of the new Dolby AC4 format using Layer Division Multiplexing technology. The broadcast used live content from the recent Winter Games in PyeongChang, South Korea. NBC provided the 4K UHD video feed featuring high dynamic range and wide color gamut. The audio with the new Dolby AC4 also created a more engaging viewer experience. Three interactive applications were developed using HTML5 and combined broadcast and broadband content to give users an interactive program guide, VoD content, plus user-customizable and up-to-the-minute statistics, athlete profiles, and country-specific information. ENENSYS’ ATSCheduler, used for this showcase, is central to ATSC 3.0 network operation. Running at a station or a central headend, the ATSCheduler encapsulates the IP streams stemming from the various HEVC encoders that deliver the compressed audiovisual content over ROUTE or MMTP protocols, and from the non-real-time server generating the signaling information and the interactive applications. It outputs the resulting ATSC-compliant multiplex using the STL (Studio to Transmitter Link) protocol through IP. The use of ATSCheduler allows the creation of an advanced on-air architecture, including MultiPLP and LDM (Layered Division Multiplexing) schemes, offering the ability to target different receivers and to provide varying levels of service – mobile, 4K Ultra HD fixed reception and so on. ENENSYS will be highlighting it’s ATSC 3.0 solutions on booth SU6521 at NAB 2018.